I get excited when I hear about a culture in Toronto that I haven’t yet added to my collection of photographs. Such was the case when I learned that an artist born in Moldova was exhibiting some of his paintings at Montgomery’s Inn last month. But I was disappointed with the show because it consisted primarily of Humber River and rural Ontario scenes. I had been hoping to see the huge vineyards and especially the many fancy wells and the villages full of tiny cottages that I remembered from my 2014 trip to that country. Moldova borders on Romania and Ukraine. It is Europe’s poorest country and very rural. But then I looked up Vladimir Topal’s website, and yes, he had paintings in his Gagauzian Folklore section that captured the spirit, the feeling of what I thought old rural Moldova should have looked like. They were full of village-type individuals – some of them floating in the sky Chagall-like. I also loved his fine black and white drawings of old Istanbul, crooked lines adding to the charm. So I went to his studio in Etobicoke. He was very gracious. He unwrapped one of his Gagauzian paintings for my camera and put it beside an unfinished picture of the Ontario landscape. It is of a village wedding. He answered questions. He lived in Istanbul for five years and he has been in Canada since 1998. He has exhibited some of his Gagauzian paintings in Toronto. While Torontonians showed an interest, they only asked questions. No one bought any. He did sell five of his 35 Ontario paintings at the Montgomery’s Inn exhibition, he says. It seems that no one here cared enough about traditional European scenes to buy his heritage art. Topal has exhibited and sold his paintings in Europe. He has to take other jobs to make financial ends meet here and he spends a couple of months in Gagauzia each year. Gagauzia is an autonomous region of Moldova, he insists, when I mention “Moldova”. There he works as a researcher in art history. 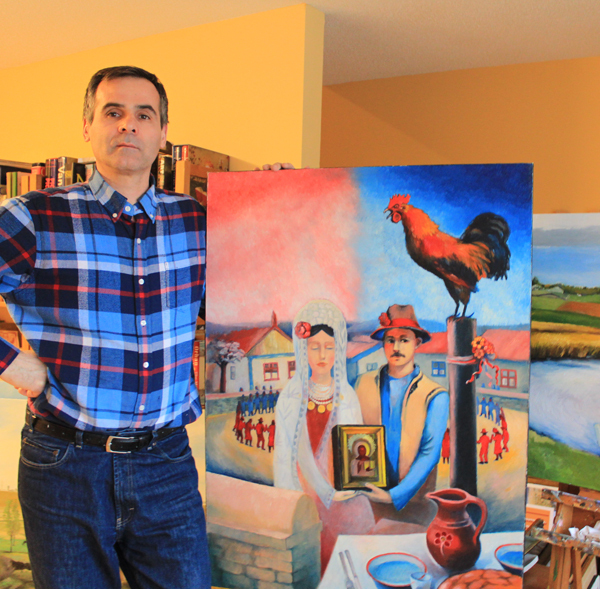 He continues to paint symbols of Gagauzia and scenes inspired by his birth country, like the rooster, which to his country is “what the beaver is to Canada”. His subjects are not real people. They are all from his imagination. His painting of a wedding is not of an actual event. It is symbolic. He is currently working on black and white drawings of buildings in Toronto, like the Old Mill. This style is completely different from his Gagauzian work and somewhat different from Istanbul. His lines are straight, the image more photographic. He will probably be able to sell some of those too. Maybe I’m asking too much for a fusion of different styles and themes, a combination of Canadian and heritage cultures. Maybe I’m being unrealistic to want immigrant artists like him to create something new, a unique Canadian genre, out of their before and after “permanent residence” here. Was I hoping for pictures of Canadian farmers floating over huge, shiny, corn-filled silos? Or groves of red maples their trunks pierced with spigots and hung with buckets? Well maybe, but the theme should be up to the artist. Topal’s website with many of his works is at: www.artstudiovtopal.com. I also loved “The Dreamer” which shows up when you open this web-site. Let us know what you think. Please drop us a note at ruthglor@hotmail.com or directly onto our “Leave a Reply form below.